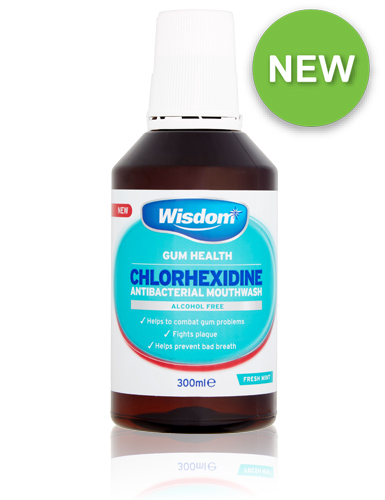 Wisdom Chlorhexidine Antibacterial mouthwash has been specially formulated with 0.2% chlorhexidine to help kill the oral bacteria which can cause damage to your teeth and gums, whilst forming a protective shield against plaque bacteria. Use after flossing and brushing if you are suffering with gum problems. Follow up long term with Daily Gum Health toothbrush, toothpaste and mouthwash for every day ultimate gum protection. Ingredients: Aqua, Glycerin, PEG-40 Hydrogenated Castor Oil, Chlorhexidine Digluconate, Aroma, Limonene, Sodium Saccharin. DO NOT SWALLOW. Keep out of reach of children. If you are pregnant or breastfeeding please consult your doctor before using this mouthwash. Discontinue use and seek immediate medical help if you experience any of the following: a rash, swelling of the mouth or face, or have difficulty breathing. These effects may be symptoms of an allergic reaction which is very rare. If irritation occurs, as with any other oral care product, discontinue use. Prolonged use of this product may temporarily discolour teeth, fillings and tongue. Staining will disappear when usage stops. Staining can be removed by twice daily brushing with a toothpaste designed for stain removal or by your dentist or hygienist. You can help avoid staining by not drinking teas, coffee or red wine, especially up to one hour after use. DO NOT use this product for longer than one month unless advised to do so by your dentist or hygienist.